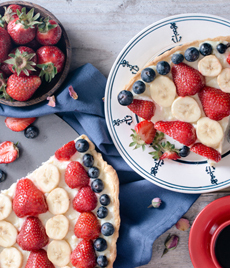  Bake this patriotic cheesecake from scratch, or decorate a purchased cake with fruit (photo courtesy Melissas.com). 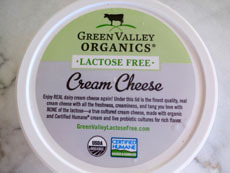 Good news for lactose intolerant cheesecake lovers: Green Valley Organics makes delicious lactose-free cream cheese, as well as lactose-free sour cream and yogurt (photo courtesy MyLilikoiKitchen.com. This All American Strawberry, Banana and Blueberry Cheesecake recipe was developed by Tom Fraker, Corporate Chef at Melissas.com. You can use the decorating theme on a custard pie, cream pie, or cake. Don’t want to turn on the oven? Purchase a plain cheesecake and add the fresh fruit. Before you start, check out the history of cheesecake. This recipe makes a tart-size cheesecake, meaning that it’s not as tall as a conventional New York-style cheesecake. The benefit: fewer calories per slice! 2. COMBINE the graham cracker crumbs, 3 tablespoons of sugar and the melted butter in a bowl. Press the mixture into a tart pan or springform pan. 3. ADD the cream cheese, 1 cup of sugar and vanilla extract to the bowl of a standing mixer. Split the vanilla beans in half lengthwise and scrape the pulp into the bowl. Whisk until well combined. 4. ADD the eggs one at a time, allowing them to completely incorporate before adding the next egg. Pour the mixture into the pan and smooth the top. Bake in the oven for 60-75 minutes, or until completely set. 5. REMOVE the cheesecake from the oven, let cool and then chill for at least 4 hours. 6. DECORATE the top: Run a row of the blueberries around the outside edge and then fill the center with alternating rows of strawberries and bananas. Before you slice the bananas, keep them from turning brown by squeezing the juice of an orange or other citrus fruit into a bowl. Slice the bananas into the juice. Toss gently with your fingers to coat all sides, and drain away the juice before topping the cake.